Food security is a critical issue for Africa today, as the continent struggles with declining agricultural stocks and high food prices. Add in the fact that human-induced climate change will further threaten already weakened productivity, and the situation is precarious. Meanwhile, environmental sustainability is being undermined. Poorly rewarded farmers — being in no position to act as the stewards of Africa’s agricultural land — continue to use techniques that adversely affect soil fertility, water and biodiversity. How can such a complex quandry be sorted out and widespread famine averted? A 2008 agriculture assessment sees global cooperation as key to solving food insecurity and environmental degradation. Compiled by 400 scientists working with the International Assessment of Agricultural Science and Technology for Development (IAASTD), the report stated that the course of agricultural development must be altered now. The way food is grown must radically change to better serve the poor and hungry, it says, if the world is to cope with a growing population and climate change. Perhaps important players have been listening to such messages. At this year’s World Economic Forum, the Japanese government announced its intention to make its environmental technology available to Africa. Then at the 2008 G8 Summit, leaders called for a reversal in the trend of declining aid and investment in the agricultural sector by pledging US$10 billion to support affected countries. Of course these kinds of steps are vital for Africa. However, as the issues of agriculture and food security are complex ones, interwoven with economic factors and social implications, Africa’s path forward remains fraught with challenges. A fuller understanding is necessary in order to begin tackling them. Though agriculture is central to African economies, it is often regarded as separate, with traditional attitudes viewing economic development as a series of stages that transfer capital from the agricultural to the industrial sector. This approach overlooks vital linkages. Constituting a sizeable chunk of Africa’s overall gross domestic product, agriculture generates approximately one third of the continent’s income. In some countries, like the Central African Republic, Ethiopia and the Democratic Republic of Congo, agriculture’s share of the GDP can be as high as 54 percent. With cropland and pasture playing such a huge role, soil quality is fundamental to sustainable economic growth. Additionally, when natural capital makes up such a large share of the total wealth, this means a particular sensitivity to commodity price cycles. Increased demand for animal feed, food and biofuels, as well as low agricultural stocks and slow-growing productivity have contributed to the steady increases in food prices, which climbed more than 20 percent in 2007 alone. Since 2000, the price of wheat has tripled and corn and rice prices have almost doubled. The impact of cereal price increases on food-insecure and poor households is already considerable. For every one percent increase in food prices, food expenditure in developing countries decreases by 0.75 percent. And while household spending on food in a developed country like the US accounts for just 10 percent of income, it constitutes more than 60 percent of income in Sub-Saharan Africa. Under low-input systems and prevailing degradation processes, the potential productivity of the soils cannot be realized. If current trends of soil degradation and population growth continue, the continent might only be able to feed 25 percent of its population by 2025, according to Karl Harmsen, director of United Nations University’s Ghana-based Institute for Natural Resources in Africa. However, in addition to soil degradation and loss of vital minerals, soil nutrient depletion is affected by external factors. The price of nitrogen fertilizer has been increasing over the years such that it has become unaffordable to most small-scale farmers. Due to a variety of factors (e.g., high transport costs, poor dealer network), African farmers pay two to four times the average world market price for fertilizers. With such constraints, the challenge to African agriculture is not only to enhance production to meet the increased food demands of the expanding population (projected at 2.4 percent per annum), but to find innovative ways to overcome the fertilizer challenge. Well thought-out use of soils must be developed so that future productivity is sustained. Moreover, ninety-five percent of Africa’s agriculture is rain-fed, making African farmers susceptible to climate variability and change. Food production is impacted by increasing aridity and moisture stress, thereby increasing food insecurity and malnutrition. One report estimates that due to the effects of climate change, the number of undernourished people in Sub-Saharan Africa will have tripled from 1990 to 2080. Source: Figure 6.2b. Natural Disasters Hotspots – A Global Analysis ©2005 The World Bank and The Earth Institute at Columbia University. Another facet of environmental degradation is deforestation. Between 1990 and 2000, Africa lost 52 million hectares of forests, equivalent to a decrease of 0.8 percent per year and making up 56 percent of the total global loss. According to the Encyclopedia of Earth, approximately 60 percent of tropical forest cleared during this period was converted to permanent agricultural smallholdings. Given these projections, countries with limited adaptive capacities to climate change are faced with significant threats not only to food security, but to social stability. Recent riots protesting rising food prices among the hardest hit people in Somalia and in parts of Central and West Africa are an indication of the potential for social unrest and civil violence. As climate change is a gradual process, there is space for creating innovative adaptative measures as an extension of good development policy. Some policy measures that merit further investigation include: creating markets in water and environmental services, investing in research and development for enhancing soil fertility and agricultural productivity, enhancing resilience to disasters and improving disaster management, and promoting social safety nets (for example, drought insurance). Rising food prices can also open a window of opportunity for African governments to make the agricultural sector profitable. With policies to improve access to inputs, such as fertilizers or fuel, and the support of governments, Africa can move from subsistence agriculture to commercial farming. Thank you to Clarice Wilson for co-authoring this article. Call for action on African food security by Christian Webersik is licensed under a Creative Commons Attribution-NonCommercial-ShareAlike 3.0 Unported License. Based on a work at http://ourworld.unu.edu/en/call-for-action-on-african-food-security/. 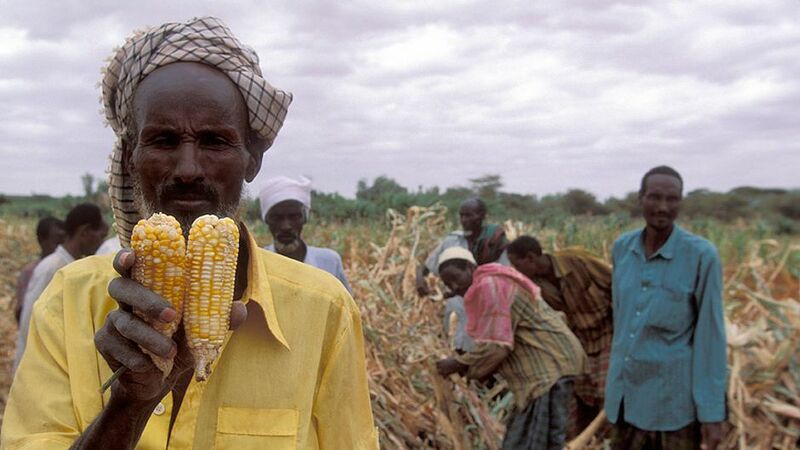 three facts that is a cause of problem about food in Africa. prices. Actually, it climbed more than 20% in 2007 alone.